*Antique Cast Iron Door Stop in our Etsy Shop. *Liberty of London Fabric from Purl Soho. We made covers with Liberty fabric for these inexpensive Ikea feather pillows. The girls use them to lounge on when reading in bed. *Detail of Vintage Wooden Sign in our Etsy Shop. *Large Ironstone Urn in our Etsy Shop, perfect for holding umbrellas. *View of Asbury Park from the Ocean Grove boardwalk. We are thinking of those who lost their homes today in an early morning fire. A heartbreaking loss for our little town. *Cozy front porch in Ocean Grove. We are feeling both sad for the loss of some of our town’s historic houses and thankful that no one was hurt today. *Post Cards to the President. I send these often, addressed to the White House. I know he will likely never read them, but I use them as sort of therapy now. *Lemon, Lemon, Lemon Cake for Josie’s Birthday. I used a version of this lemon poppyseed cake and this lemon frosting, along with lemon curd from Trader Joe’s. Our backyard hellebores bloomed just in time to use for decoration. *More Liberty of London. I have a bit of an addiction. Stay cozy and have a great weekend! * Antique Ironstone Tureen – Has a lovely blue tint, octagonal shape and was made around the 1880s. The tureen is still sturdy and ready to be used again. *Five Vintage Children’s Pillow Cases – Each has a different handmade detail. *Set of Unused Vintage Linen Tablecloth and Napkins – These ten napkins and tablecloth still have their original “Made in Belgium”labels and are made of beautiful quality linen. *Paint-by-Number Winter Scene – The colors of this little painting are bright and calm. We are looking forward to spring and green and, (just as importantly), stoop sale weather! Just one more week of winter! Keep your eyes open for more vintage treasures coming soon. Hello and happy First Week of the Year! I hope you are all weathering the crazy cold in a cozy spot. 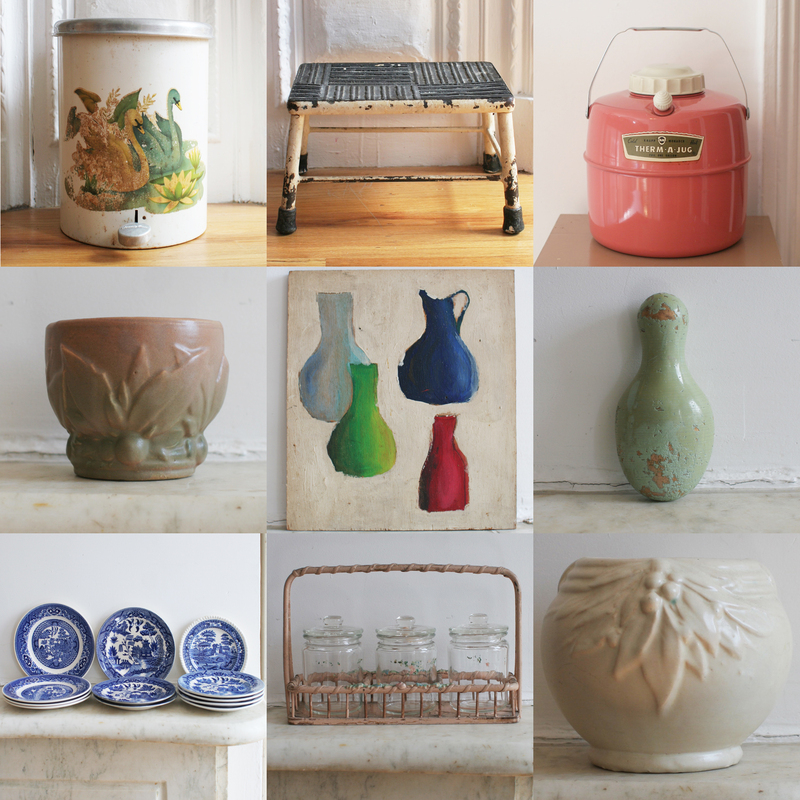 We have been staying warm inside, and staying busy posting new vintage finds in our Etsy shop. (I am having a really hard time not sneaking the two sets of juice glasses into our own cabinets). I will be putting up new listings this week, so stay indoors and keep checking back for fresh treasures! We have been busy listing some new floral finds on our Etsy shop. I love these metal Toleware flowers! They were made in the 1940s and 1950s, often in Italy. They were inexpensive at the time, and the colors are still vibrant today. The hooks would be adorable in a child’s room. Flea Market Finds: For Sale! Anyone who knows me knows that I cannot walk by a stoop sale or drive by a flea market without stopping to take a look. Well, we here at Domestic Space are excited to announce the addition of vintage treasures to our Etsy shop! We will be updating our shop with fresh finds as they come in, and I will post alerts so our readers can be the first to know. Let us do dusty digging and so you don’t have to. We hope you will enjoy shopping our new curated collection of flea market finds as much as we enjoy finding them! Our Etsy Shop is Open! Our Etsy shop is open! We have been working hard to get the final details finished and I am happy to say we are open for business. You can find our Headband Feather Crowns at http://www.etsy.com/shop/jeannerondeau. The crowns are made in adult and kids’ sizes and my girls like to wear them for dress-up. All of the pieces are made by hand using vintage fabrics, beads and sequins and each crown is one-of-a-kind. We also do custom work. We will continue to add more items to the shop, so please visit us often!